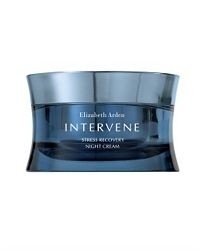 Recover with Intervene Stress Recovery Night Cream. This lightweight, intensive moisturizer, with new youth preserving complex, helps recover skin from daytime damage. - Defends skin cells from the aging effects of stress. - Provides a more revitalized and radiant appearance. - Retinyl Linoleate provides a smoother and firmer look. - Formulation is lightweight but an intensive treatment. Water/Aqua/Eau, Dimethicone, Hydrogenated Polyisobutene, Glycerin, Glyceryl Stearate, Butylene Glycol, Tridecyl Salicylate, Caprylyl Methicone, Cetyl Ricinoleate, Dipentaerythrityl Hexacaprylate/Hexacaprate, Tridecyl Trimellitate, Peg-100 Stearate, Isododecane, Cetyl Alcohol, Teprenone, Narcissus Tazetta Bulb Extract, Trifolium Pratense (Clover) Flower Extract, Sodium Hyaluronate, Retinyl Linoleate, Tocopherol, Tocopheryl Acetate, Caprylic/Capric Triglyceride, Neopentyl Glycol Dicaprylate/Dicaprate, Tridecyl Stearate, Sodium Pca, Trehalose, Urea, Lecithin, Palmitoyl Tetrapeptide-7, Laureth-7, Steareth-20, Peg-60 Hydrogenated Castor Oil, Polyquaternium-51, C13-14 Isoparaffin, Polyacrylamide, Polyethylene, Disodium Edta, Mica, Parfum/Fragrance, Butylphenyl Methylpropional, Citronellol, Limonene, Linalool, Benzoic Acid, Butylparaben, Ethylparaben, Isobutylparaben, Methylparaben, Phenoxyethanol, Potassium Sorbate, Propylparaben, Sorbic Acid, Chlorhexidine Digluconate, Chlorphenesin, Titanium Dioxide (Ci 77891).